I would like to inform you of a concert that will take place at St. Peter’s Church, Bocking, on Saturday 16th June, starting at 7.30pm. 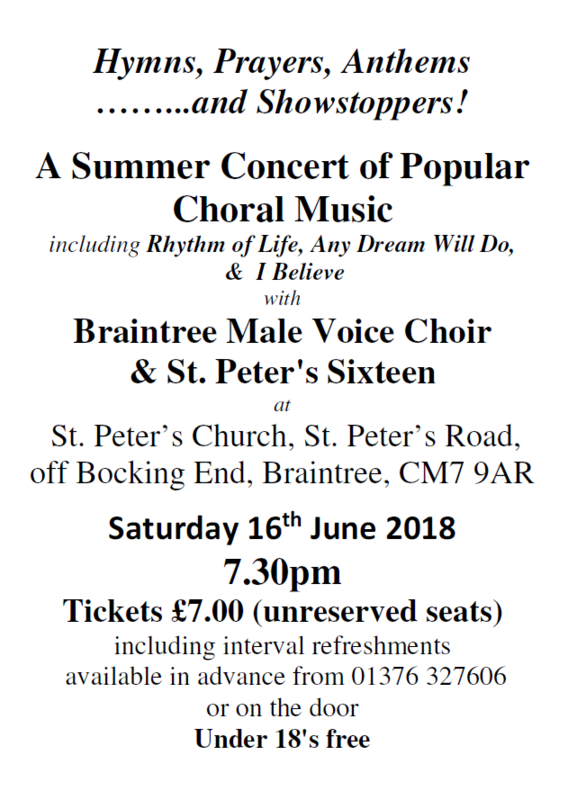 It is entitled ‘Hymns, Prayers, Anthems…..and Showstoppers!’, and will feature well loved music sung by Braintree Male Voice Choir and St. Peter’s Sixteen. As well as settings of popular hymns and anthems, there will other sorts of ‘anthems’ from the world of pop music and the stage, as well as national anthems. It may all get a bit confusing! Tickets are £7.00 (unreserved seats), with under 18’s free. They will be available on the door. If you would like more information, please contact me. I have attached copies of the handbill, which you may be able to print off and display or pass on to someone else who may be interested. Or, you could just forward this message to some of your friends! Proceeds from the concert are going towards St. Peter’s Organ Improvement Fund. Without going into too much detail, have plans to improve our excellent organ by enhancing the tonal range of the lower pipes. This is not a massive scheme by any means. It is easily achievable and will go a long way towards completing our organ. Many thanks for reading this e-mail, and I hope you can come along to what is going to be an excellent concert.